In the USA, FDA regulations regarding environmental monitoring for Salmonella, welfare concerns for molting practices, and economics related to molting programs have led some egg producers to adopt a single lay cycle management program. Single cycle programs typically involve managing continuous production from laying hens to 85-95 weeks of age. In managing commercial layers for a single lay cycle the procedure to extend lay cycles presents a few challenges that can be addressed through good management during pullet rearing and optimized nutrition. Persistency of lay and egg size can be directly correlated with these two important aspects of layer management. Additionally, adjustments to the vaccination and health programs should be considered for birds managed for a single cycle. Adequate preparation of the pullets and attentive nutritional management will lead to a successful single laying cycle. As outlined in the Hy-Line Technical Update, “Growing Management of Commercial Pullets,” the rearing portion of a laying hen’s life is critical to achieving maximum genetic potential. Uniform pullets that meet or exceed target body weights will have the frame and bone structure necessary to produce large numbers of high quality eggs. Heat stress prevention for hot climates (desert, arid, seasonal) – Implementation of controlled “heat spikes” during the first seven days of brooding by increasing the pullet house temperature by 2°C (3.6°F) above the recommended brooding temperature for 2 hours once each day during the first 7 days of brooding. This controlled temperature spike will promote the production of low molecular weight heat shock proteins that may be protective during periods of heat stress encountered during lay. Body weights – Recording accurate pullet body weights is critical to tracking pullet maturation. Pullets must develop the skeletal frame and soft tissue reserves that allow them to enter production and persist in lay. Weigh pullets weekly, starting at 3 weeks of age. Weigh at least 100 birds, or at least 3 full cages in 3 different locations in the house. Always weigh a full cage and weigh the same cages every time. Continue weekly body weights until 32 weeks, and then weigh at least every 2 – 4 weeks. Bird space – Space per bird in pullet rearing can have a major affect on bird weight and maturation. Allowing adequate space for each pullet to eat and drink efficiently will help pullets to reach target body weights and achieve uniformity above 90% at point of lay. Give at least 48 sq. inches (310 sq. cm) of space per bird by 6 weeks of age. 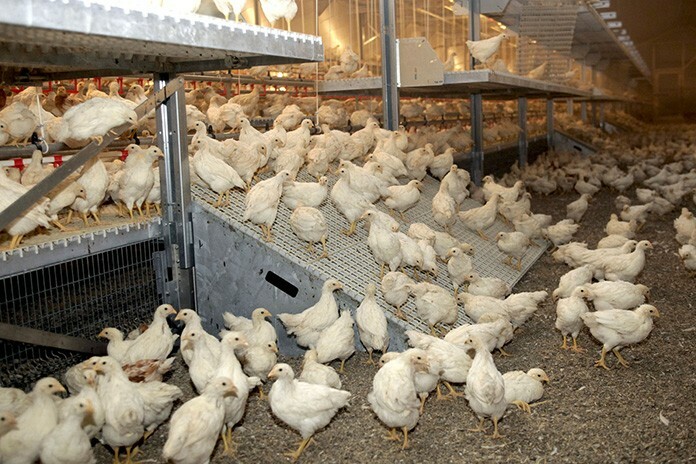 Lighting – Longer, slower step down lighting programs can counteract or prevent early maturity of pullets, especially in flocks that come into lay during spring and summer. Extending the light step down to weeks 12-13 of the growing period (instead of the traditional weeks 7-8) can help increase body weights and prepare the pullets for stress during the onset and peak of lay. Midnight feedings – In any climate where pullets are not consuming enough feed, a midnight feeding may help improve intake. A midnight feeding can be implemented as soon as there are 7 hours of dark in the lighting schedule. Starting a program a few weeks before moving pullets to the lay house can help increase the reserves of the pullet as she begins to lay and goes into peak production. Leaving the midnight feeding in place for hot climates can help maintain feed consumption through the stressful heat event, and can be maintained as long as necessary. In temperate climates, the midnight feeding can be removed after one month of production. Midnight feedings should be gradually removed over 3-4 weeks to avoid disrupting the flock. Geneticists continue to make great strides in the production characteristics of the laying hen. As the genetics are improved, the diet formulations must also meet the metabolic demands of the bird. Increased egg numbers, earlier maturation, and extended persistency of lay can only be achieved if the pullets and hens receive proper nutrition. Nutritional maladies such as osteomalacia and/or osteopenia, commonly known as soft bones, can be detrimental to flock liveability and egg quality. Flocks with poor or inadequate nutrition can also face post peak dips in production, or even layer fatigue due to depletion of body reserves. It is critical to feed the modern layer based on the most recent management guide recommendations for macro and micronutrients. Calcium source – Pullet and pre-lay diets should only use fine powder-like limestone as a calcium source. This is recommended to prevent feed impaction in the crop that can occur with larger particle calcium sources. The fine powder calcium is also more easily absorbed by chicks, helping with bone growth. Phase feeding – Pre-peak diets can benefit strains of birds that come into peak production eating below standard grams/bird (pounds/100 birds). Pre-peak diets are tailored to meet the energy requirement of the birds which preserves breast muscle during production. The palatability of the pre-peak diets also help transition the birds onto the higher calcium layer rations. Increasing calcium size – Introduce large particle calcium (>2mm) when birds are peaking in production, at a rate of 50% of the calcium provided. Large particle calcium provides slow release of calcium between feedings, as the particles are ground down in gizzard. Osteomalacia – Also known as “soft bones”, is a condition commonly found in flocks that are fed diets deficient in available phosphorus, calcium, or vitamin D3. It is critical to feed balanced diets with sufficient available phosphorus (irrespective of phytase) and adequate calcium. This is important because a laying hen is not fully mature until 32 weeks of age. Flocks that develop soft bones (seen clinically as crooked keel, down in the legs) at this age will have reduced persistency and poor shell quality late in lay. The most recent management guides should be consulted to determine the proper phosphorus and calcium levels in each diet. Amino acids – Diets can be balanced for the limiting amino acids, instead of based on total crude protein. Feeding to the specific amino acid requirements (Lysine, Methionine, Threonine, and less commonly Tryptophan, Valine, and Isoleucine) via use of synthetic forms will provide more space in the diet for energy, especially in the form of starch. If rations are formulated based on crude protein, birds often receive excess amino acids which results in increased egg weights and high levels of uric acid in the blood, potentially having deleterious effects on bird performance. Dietary Fat – Fat levels in diets should remain below 5%. Fat is an important energy source in the diet, but above 5% inclusion can lead to increased egg size. Utilizing starch for energy can prevent the increase in egg size seen with high fat levels. Modern commercial layer flocks can produce well in single lay cycle production schemes. In order to maximize egg numbers and to control egg size, it is critical to ensure that uniform pullets enter the lay house at recommended body weights, with a solid frame and breast muscle development. Additionally, birds should be fed diets that are formulated to allow them to reach their genetic potential. A single lay cycle program may provide an economic advantage for producers looking to explore new management techniques.